Like manna from Heaven, Uncle Buck‘s Nia Long, and Brian Baumgartner of The Office, are coming to the second season of the Hand of God TV series on Amazon. The duo joins the Hand of God cast, including Ron Perlman, Dana Delany, Andre Royo, Garret Dillahunt, Alona Tal, Julian Morris, Emayatzy Corinealdi, and Elizabeth McLaughlin. Hand of God is psychological drama about morally corrupt judge Pernell Harris (Perlman). After suffering a breakdown, Harris believes God is directing his quest for vigilante justice. Long (The Best Man) will play Isadora “Izzy” Williams, described as a tough but charming journalist who has a history with Mayor Robert ‘Bobo’ Boston (Andre Royo of The Wire). Baumgartner, best known for his long-running role as Kevin on NBC’s The Office, will play Dr. Olonari, a successful and eccentric brain specialist in San Francisco. Playing a brain specialist is, to say the least, quite a departure from Baumgartner’s Kevin Malone character. Since The Office ended on NBC, in 2013, Baumgartner’s TV work has consisted of guest spots on shows including Mike & Molly, Criminal Minds, Law & Order: Special Victims Unit, Bad Teacher, The Bridge, Hot in Cleveland, and Melissa & Joey. Long’s past TV work includes The Divide, House of Lies, The Cleveland Show, Big Shots, Boston Legal, Third Watch, and Judging Amy. She plays Alexis on ABC‘s upcoming Uncle Buck TV show, starring Mike Epps. Inspired by the John Candy film of the same name, Uncle Buck premieres Tuesday June 14, at 9:00pm ET/PT. Learn more. 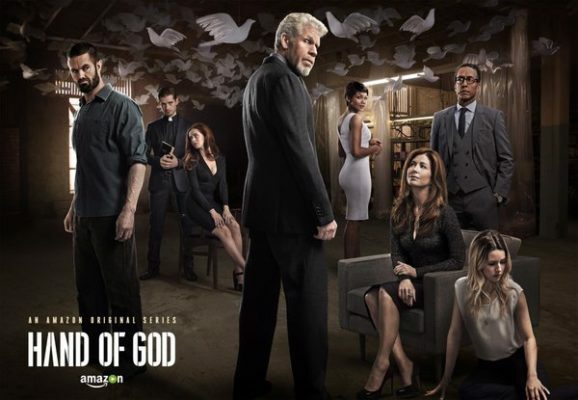 Amazon renewed Hand of God for a second season, back in December. Although the premiere date has not yet been announced, season two is expected to debut later this year. What do you think? Did you watch the first season of the Hand of God TV show? What do you think of Long and Baumgartner joining the cast? Let us know, below. More about: Amazon TV shows: canceled or renewed?, Hand of God, Hand of God: canceled or renewed? I can’t wait for hand of God to come back it was an awesome show but too long in between seasons! Love the show, great drama and suspense. Can’t wait for season two. This was a great show! Perlman is an amazing actor! Can’t wait for Season 2!! !